Case Example 10 - Matthew D. Hepler, M.D. 59 yo woman with brucellosis infection and progressive kyphosis and myelopathy. 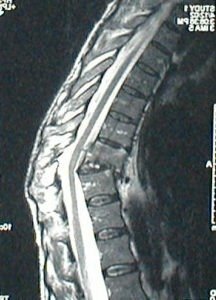 Case review: 59 yo woman who developed brucellosis infection of thoracic spine with destruction of the T10 and 11 vertebral bodies resulting in progressive kyphosis, cord compression and paraplegia with bowel and bladder dysfunction. Preop xray and MRI demonstrate thoracic kyphosis measuring 75 degrees with collapse/resorption of the T9 and 10 vertebral bodies and vertebral translocation T9/11. The patient was treated anterior vertebral body resection and reconstruction with vascularized rib graft and fibular strut allograft followed by posterior fusion and instrumentation of the thoracic spine. Post op xrays demonstrate restoration of physiologic thoracic kyphosis and spinal balance and complete recovery of lower extremity strength and bowel and bladder function.